Reporting corporate changes to your licensing authorities is time-sensitive. Failure to report these changes in a timely manner can be costly. We're here to help! Is your company going through changes that may require actions to maintain your collection licensing? 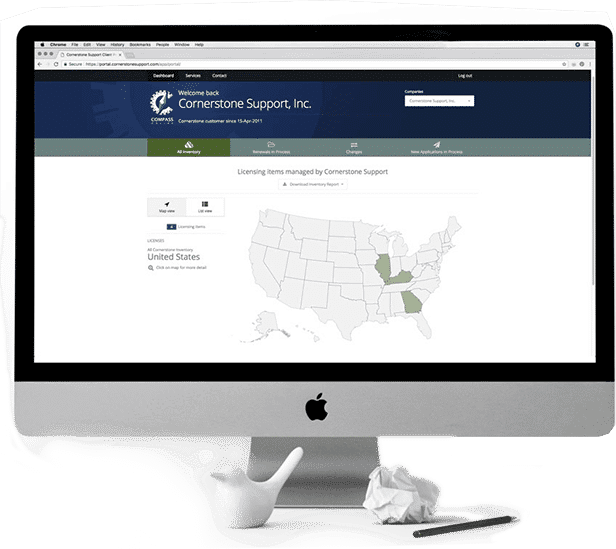 Cornerstone Support has established a reputation over 20+ years as the premier licensing service provider to the collection industry. We’ve frequently had requests to assist agencies that are dealing with civil and/or administrative action related to issues with their state collection licenses. While some are from agencies that did not have a license, surprisingly many are from agencies that unknowingly are out of compliance because they did not appropriately report a corporate change. Though a corporate change may seem trivial to an agency, the consequences of not reporting the change can be costly and significant. Time is of the essence with regard to reporting corporate changes. Don’t get stuck with avoidable fines and penalties by timely reporting corporate changes. The statutory regulations for the vast majority of jurisdictions prohibit the transfer of debt collection licenses in the event of a change in the equity positions on the balance sheet of the licensed corporate entity (merger, acquisition, or re-capitalization.) Some level of notification or relicensing is almost always required. Certain jurisdictions require that all locations from which debtors are communicated with maintain a separate license. Obtaining a branch license can be as involved as the original license or in some cases as uncomplicated as a letter notifying the jurisdiction about the new location. Jurisdictions require notification of a change in corporate officers or a licensed / listed collection manager. Certain states will require background checks be performed prior to the new officer or manager approval. Other states will require managers to take and pass state administered exams prior to the new manager approval. Written notification of a change in the corporate address listed on your licenses is required in most jurisdictions. Certain states will require the surrender of the previous location’s license. Bond riders indicating the new address are also necessary in most states with collection agency bonding requirements. Changing from one type of entity to another (ie. from a C Corporation to an LLC) is a significant event in the life of an organization. Reporting this change to the Secretary of State is not enough. Some level of notification or relicensing is almost always required. 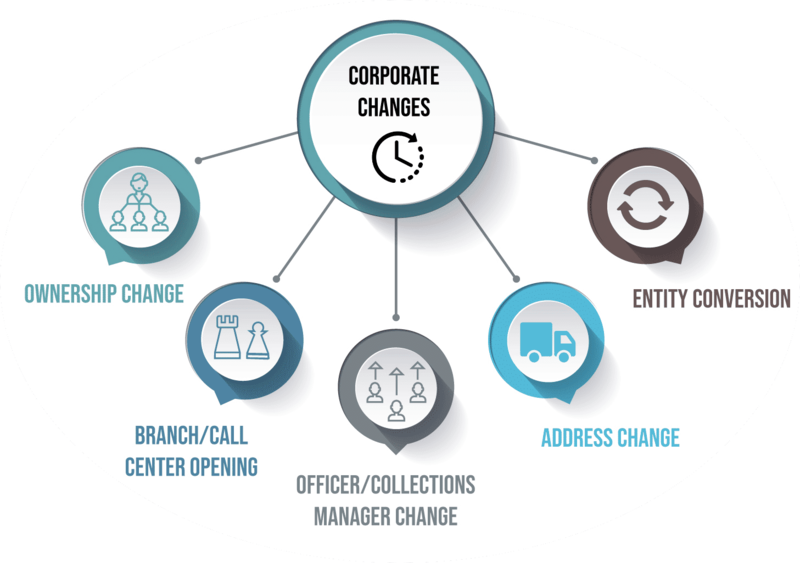 These are some of the more common corporate changes that must be reported to the states in a timely manner. Failure to do so could result in fines, penalties or even loss of license. Safeguard your business by partnering with a licensing servicing company like Cornerstone Support that can allow you to have confidence and help to stay current on all of your licensing needs. Even if your company handles its own licensing, managing a corporate change may likely require competent outside help to accomplish it in a timely manner. Do licenses and registrations Expire? Yes; most licenses and registrations renew on an annual basis. If my company has more than one location, do I need more than one license? Yes; many states require branch licensing for each physical location from which collection activity occurs. How often do state statutes change? State statutes change regularly, which is why reviewing your licensing scope on a yearly basis (at a minimum) is imperative to ensure proper licensing. Do creditors that I collect on behalf of care about my licensing? Yes; we are often asked by large credit grantors to perform an assessment on licensed collection agencies. Often, when gaps are identified, creditors will move their business to a properly licensed agency.